After Protests Over History Curriculum, School Board Tries To Compromise For weeks, Colorado high school students protested a proposal that the AP history course promote patriotism. The school board dropped some controversial language, but voted to review the curriculum. 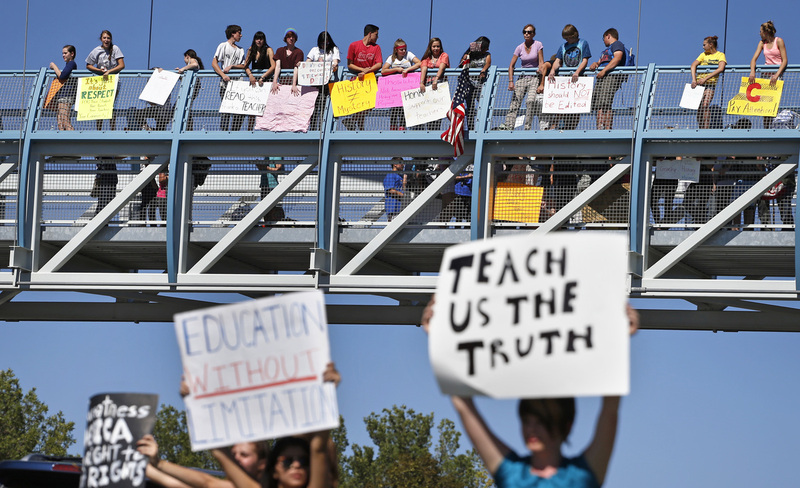 Students line a busy intersection and overpass in the Denver suburb of Littleton, Colo., on Sept. 25, protesting a Jefferson County School Board proposal to emphasize patriotism and downplay civil unrest in the teaching of U.S. history. The resolution stated that AP history classes should promote "patriotism and ... the benefits of the free-enterprise system" and should not "encourage or condone civil disorder." "Basically, what I am asking for is for history to be taught complete," Williams said in an interview with the local Fox affiliate. "So the good, the bad, the ugly, without bias." Jefferson County, Colorado's second-largest school district, has been in turmoil ever since a conservative majority was elected to the school board in November 2013, but Williams' proposal set off a new wave of unrest. It started with 100 students, including Ben Smith from Standley Lake High School, northwest of Denver. He says students don't want their history censored and don't like that the resolution called for promoting the positive aspects of U.S. history. The negative parts of American history aren't necessarily unpatriotic. We need to know those things so we don't repeat them in the future. "The negative parts of American history aren't necessarily unpatriotic," Smith says. "We need to know those things so we don't repeat them in the future." The protests spread throughout the district to more than a dozen high schools. Teachers also were angered: Four high schools closed for a day when teachers organized a "sick out." They say the board isn't listening to them — or parents — on a range of issues, including AP. But the Advanced Placement curriculum, for which students can get college credit, is the flashpoint. The revamped framework aims to de-emphasize rote memorization and instead develop critical thinking skills. But some conservatives say there's an anti-American bias. Larry Krieger, a retired New Jersey high school teacher who is leading a national fight against the new framework, testified via video conference before Colorado's state board of education. He says the new materials don't mention events like D-Day or key historical characters. "The founders are not discussed," he says. "Ben Franklin: not there. James Madison: not there." But that doesn't mean teachers will leave out D-Day or the nation's founders, says Fred Anderson, a history professor at the University of Colorado who helped write the new framework. "These are usually the very best teachers in a school. You don't have to tell them to talk about Wilson and Madison, and Franklin and Washington at the Constitutional Convention — they do that," he says. "They would find it incredibly condescending to be directed at that level, so the absence of mention is not in any sense an exclusion — and it's a misconception, I think, about the framework that that's the case." In Jefferson County, after two weeks of protest, the original language about patriotism was dropped. On Thursday night, the school board stripped of the most controversial language and then passed the resolution, which still creates a committee to review course materials. Meanwhile, the College Board, which administers the AP test, says that if a school or district censors essential concepts from an AP course, that course can no longer bear the "Advanced Placement" designation.